Labs Live aims to gather together Christian techies and creatives to help grow people's faith and bring people to faith through technology. The first event was held near Spitalfields, London in 2018 and our second event was held in MediaCityUK, Manchester in 2019. We've already sourced an amazing set of ideas through these previous events and it's amazing to see Christians working together! 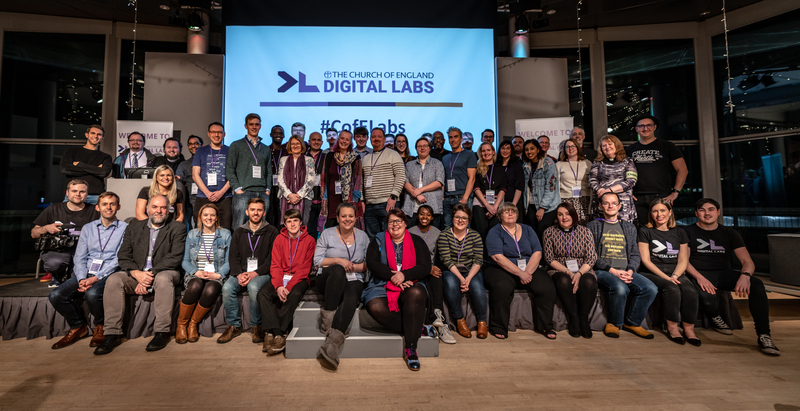 Our second event took place in the iconic MediaCityUK in Manchester and saw 50 Christians techies and creatives come together to develop solutions to further the Church’s work in the digital space. The event ended with participants presenting their solutions to the judging panel, who were chosen for their knowledge of digital, creativity and understanding of the breadth and depth of the Church of England. The panel, led by the Head of Digital for the Church of England Adrian Harris, includes Rt Revd David Walker, Bishop of Manchester, Lynda Davies, Dr Bex Lewis and Mike Shaft. Want to know which idea won Labs Live 2019? Find out about the event including which idea we'll be taking forward. Find out about the judging panel for the 2019 event. Our first event, held in East London on Saturday 24th February 2018, saw around 60 people join together who have passion for using technology to equip and enable our 16,500 local churches. Delegates travelled from across the UK, Europe and USA to look at two broad themes: how to bring people to faith and how to grow people’s faith. Read about the launch of Labs Live. Winners of Labs Live 2018 revealed! Find out the winners for the first Labs Live. Labs Live is part of the Church of England’s Renewal and Reform programme, aimed at helping us become a growing Church for all people and for all places.